This is, without a doubt, going on my Thanksgiving table. What is it about Gruyere cheese that is so dang good? I love its assertiveness on the palate. With that said, “Heavens to Murgatroyd” my friends, this is one yummy gratin. I am truly in love with it. You must make this or you will forever be sorry. No, I’m not being dramatic, just assertive, like the cheese. The Wildboar, who would never go out of his way to eat broccoli, wanted more and more. I knew it was good. This is another dish I cannot be alone with. I would eat all of it and then pick the brown bits of cheese from the sides of the pan. No joke. If you are celebrating Thanksgiving elsewhere and need to bring a side dish, I’ll give you instructions on how to prepare it for travel. BUT don’t wait for Thanksgiving to make this, have it today! Fill a large saucepan with 1 inch of water and fit with a steamer basket (or fill a large pot with 1/2 inch of water). Bring to a simmer. 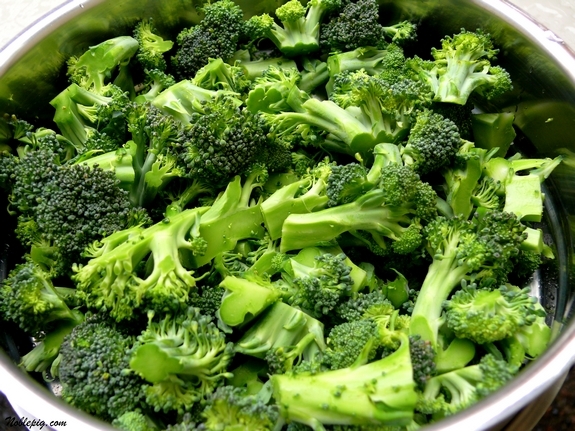 Place the broccoli in the steamer basket, cover and steam until just tender, about 4 to 5 minutes; transfer to a large bowl. Melt the butter in a medium saucepan over medium heat. Add the flour and cook, stirring, for 2 minutes (do not let it darken). Whisk in the milk and simmer until slightly thickened, 3 to 4 minutes. Remove from heat and stir in 1 cup of the cheese, salt and pepper. Toss the sauce with the broccoli. 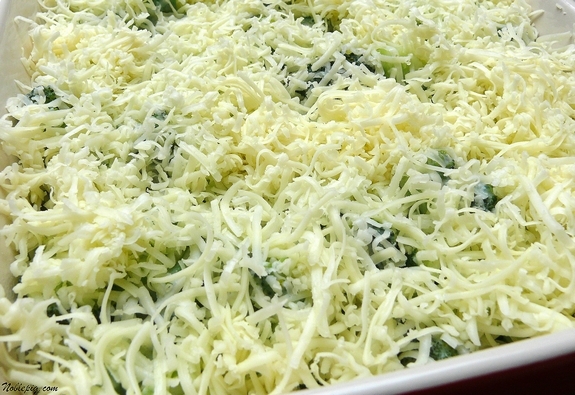 Transfer the broccoli mixture to a shallow 3-quart baking dish and sprinkle with the remaining cup of cheese. Bake until bubbling and golden brown, 35-40 minutes at 375o. Let sit 10 minutes before serving. There are no words for this. You’ll see. Melt the butter in a medium saucepan over medium heat. Add the flour and cook, stirring, for 2 minutes (do not let it darken). 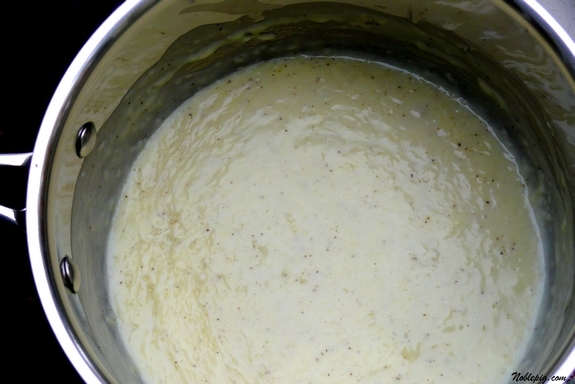 Whisk in the milk and simmer until slightly thickened, 3 to 4 minutes. Remove from heat and stir in 1 cup of the cheese, salt and pepper. Toss the sauce with the broccoli. BEFORE YOU LEAVE: Prepare the gratin but do not bake. Leave at room temperature for up to 2 hours or refrigerate for up to 1 day. WHEN YOU ARRIVE: Bake at 375o from room temperature, 40 to 55 minutes. I’ve been attending cooking demo classes at our local natural foods store. At a Spanish Tapas class I attending on this last Wed., she made some cauliflower much the same way. It was to die for! It had half and half that was infused with almonds, some smoked paprika, Manchego cheese and a whole milk, buttery roux and sauce. Then it had some chopped almonds on top with more cheese. If you want the recipe, I can get it to you. Either this or your recipe would be great with broccoli or cauliflower and/or a combo. Mmm. Now I want some right now. I think even my kids would eat it and after class decided it was for sure going on the T-day menu. Can’t wait to try yours. OMG, this is so beautiful with the browned cheese on top. A must try fro t-day and even for a regular dinner, why not! This looks and sounds fabulous. i am definitely adding it to my “to make” pile, but I’ll put it near the top! I et so tired of boring side dishes. Oh my, I think I’m going to need to make this for dinner this week. Looks delicious! I make something very similar to this, but with cauliflower and broccoli and cheddar instead of gruyere. The, I top it with buttered breadcrumbs and sliced tomatoes. mmmmm. I don’t think I have ever had gruyere but now seems about as good a time as any to try it, especially seeing as how it’s on broccoli. Such beautiful colors too! Mmmmmm. Holy wow, this looks amazing. I can’t wait until Thanksgiving to make it, it’s a must this week. This, without a doubt is going on my Thanksgiving table too. This looks WONDERFUL. Thanks for the post Cathy. Oh my. I need some of this! Thanksgiving has come and gone, but this looks like something that will be heading to my table regardless. I need to make this. Seriously. I *love* broccoli and that looks (and sounds) absolutely delicious!! I’m definitely making this soon. That looks so amazing! I think I might try making that this year at Thanksgiving instead of the same old boring green bean casserole. I’m guessing I can put it into 2 or 3 casserole dishes for just the two of us. Excellent! I LOVE your recipes and LOVE your blog/website… I just wish I could see the pictures. I could at the beginning but not sure what happened and now I can not. I have no problems with my computer so not sure why this has happened… Wonder if anybody else has this prob? Going to make this for Thanksgiving!!!!!!!! SOUNDS DELICIOUS!!!!!!!!!!!! Almost everything tastes better with gooey melted cheese on it. 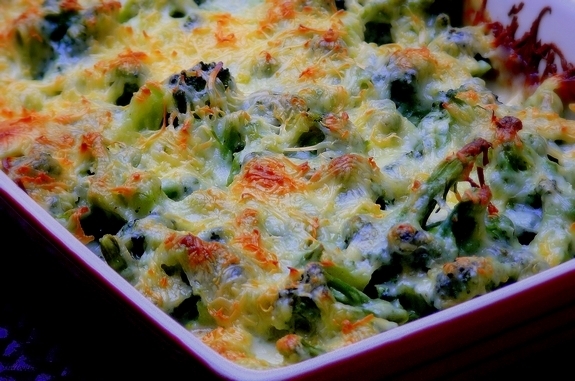 I never used to love broccoli, but I make a similar gratin and it’s always a hit. There’s no substitute for good quality gruyere cheese. It makes everything so much tastier. Oh Lord, I might actually get the big guy to eat those green trees with this one. Looks amazing and though it just missed Canadian Thanksgiving, it’s going on the “must try” list before the American version. We get to celebrate both…lucky us!!! We are broccoli lovers over here. This is a very nice recipe. I love the way the cheese browned up so nicely on top. I love the brown bits of cheese!! One of the great things in winter is vegies from the oven, warm and comforting. I have been reading you, just not commenting much of anywhere, my hands have been busy even while I am on the computer. Now this might actually get my daughter to eat broccoli! So many yummy things I love in this recipe and it is most definitely going in my very near “to be made ” pile. I can’t wait to make and eat it! That is one delectable dish! I think I’m gonna sit and pick off all the crunchy topping! This does look fantastic! I agree, why wait till thanksgiving to try this. Yum, looks like a great broccoli dish. For sure you hvae convinced me to try this dish. Without a doubt! Did I mention that I was already drooling from the last recipe? This one I must make! I can’t wait to have this…but I too cannot be alone with it. And the browned bits are my favorite. NO matter how full I am I will pick and eat those all before I can wash the dish-God forbid they got wasted! 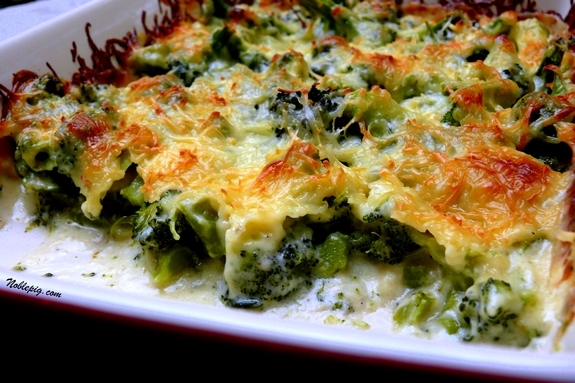 We are huge broccoli fans here and this looks like a must try!! This looks wonderful! I think the secret to Gruyere is those lovely Swiss cows happily grazing on the mountainsides. It is such a beautiful setting how could the cheese help but be delicious? I make a broccoli cassarole that my family loves but I’ll be trying this one. Just not tonight, I’m having chicken salad sammys! That is sinful. I would eat it all. Happy Thanksgiving. You can see how behind I”ve been on my reading. I made this as a side dish for thanksgiving and everyone loved it! They just went crazy, I’m probably going to add it as a regular side dish in the rotation, It’s perfect! 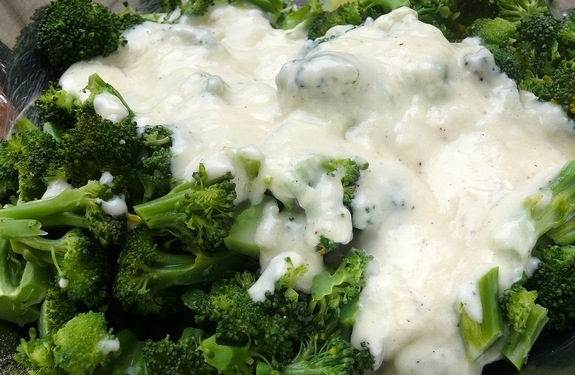 I adore roasted broccoli, but adding cheese can only improve the flavors! Have some in the oven right now for tomorrow’s supper. Second time making it. This one’s definitely for the keep file. Delicious and so easy to put together. This will make an appearance at our Thanksgiving table in place of the green bean (I cannot stand it) casserole! Looks wonderful! I highly recommend this dish. Wow – out of the ballpark with this one. Absolutely excellent. Best recipe for broccoli (as a side dish) that I have ever found. Leftovers make great soup, too, pureed with beef broth and mashed potatoes. Thank you very much for this recipe!